T.J. Oshie shares his father's name. 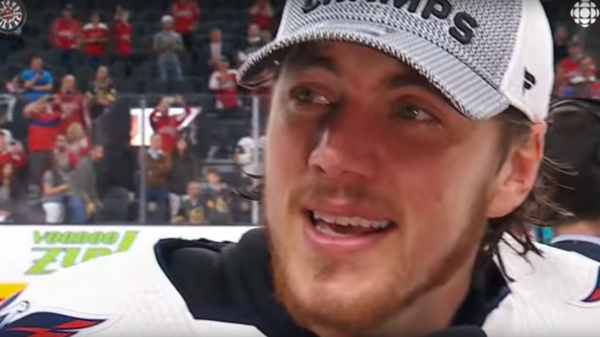 The Washington Capitals winger, born Timothy Leif Oshie, won his first NHL title Thursday night in Las Vegas — more than five years after his father, Tim, was diagnosed with early-onset Alzheimer's disease. Tim Oshie has been a constant presence in his son's life, first as his youth hockey coach in Washington state, then after a divorce, when he and a teenage T.J. moved back to Tim's hometown in northern Minnesota. And now in his mid-50s, he was here in the stands, watching after the game as his son embraced his teammates. So when T.J. was asked about his father, whose love has stayed steady even as his memory has faltered, it was tough for him to stay composed. "My dad — oh boy. He doesn't, uh — he doesn't remember a lot of stuff these days," Oshie said, fumbling for the right words. "He remembers enough." And he paused to wipe his eyes. "But I tell you what, he's here tonight. I don't know where he's at," Oshie added, searching the crowd around him. "But this one will stick with him forever. You can guarantee that." It was in 2012 that Tim was diagnosed with Alzheimer's, according to ESPN. And as T.J. himself has acknowledged, sometimes its insidious effects have seemed overwhelming. "It's a very scary thing. It's a hard thing to deal with, and sometimes, it's a frustrating thing to deal with," he told the network in 2014. "We have nothing right now as far as getting rid of it. With all the medicines and all the doctors in the world, I think it's something that hopefully we'll be able to stop — and get rid of sooner than later," he added. "So that's why we talk about it, that's why we're open about it. Maybe not soon enough for my dad or for me, if that happens to be the case eventually down the road, but hopefully for my kids and my grandkids." So they've taken an active role in events to find a cure. And Tim Oshie has had no intention of letting the disease sideline him. He was there when his son scored his first goal as a Capital against his former team last year, after all, and he has been there for the Caps' annual dads' trip. And he was there, finally — after the final buzzer sounded Thursday night, after T.J. lifted the Stanley Cup and after that difficult postgame interview — to take the ice yet again with the son who shares his name. But to T.J., it doesn't matter what his father's birth certificate reads. His father is "Coach Osh." "Wait, let me get one with Coach," he said to the photographers on the ice, according to The Washington Post. Then he waved to his dad: "Come here, Coach." And with a great heave, father and son lifted Lord Stanley's Cup together.